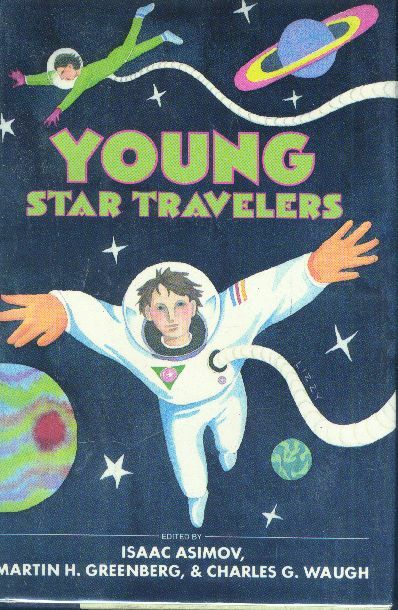 The children in these stories have one thing in common—they are all young star travelers. Some have never seen their home planet, Earth. Some remember what life on Earth was like, and the memories are terrifying. Some children live on newly discovered, unexplored planets with life-forms unlike anything imaginable. And still others live in the depths of man-made worlds—never seeing the light of the sun and with only robots for companionship. Isaac Asimov, Martin H. Greenberg, and Charles G. Waugh have selected stories by Arthur C. Clarke, Fed Saberhagen, Andre Norton, and Ray Bradbury, among others, that speculate on what life might be like for children of tomorrow who will travel the stars as easily as children today travel highways on Earth. This is a rather unimpressive anthology, even in the “Young So-and-so” anthology series. There’s nothing here by Asimov—which is a shame, because stories such as “The Heavenly Host” would fit in well, for example. On the whole, I can’t get terribly enthusiastic about this anthology.